The 2018 Living Planet Report is the twelfth edition of WWF's flagship publication. The biennial report, produced in collaboration with the Zoological Society of London, uses the global LPI as a measure of the health of 16,704 populations of 4,005 species. Download the full report here and access the data behind the global LPI below. 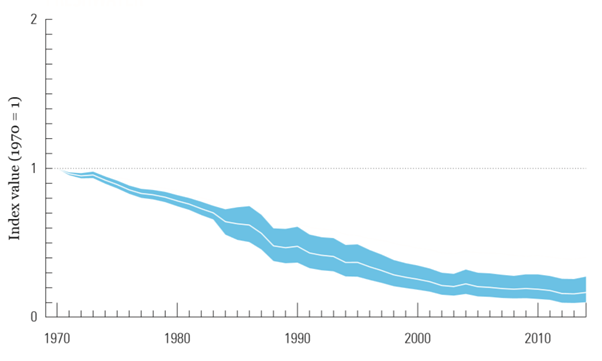 The main statistic from the report is the global LPI which shows a 60% decline between 1970 and 2014 (Figure 1). 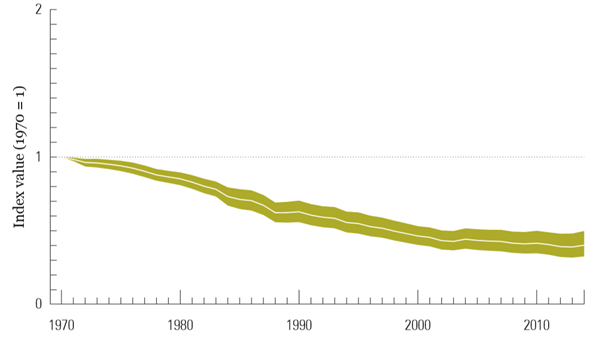 This means that, on average, animal populations are well over half the size they were in 1970. The LPI can be divided into one of five major biogeographic realms, regions characterized by distinct assemblages of species: the Nearctic, Palearctic, Neotropical, Afrotropical and Indo-Pacific. This gives us a better understanding of how biodiversity is changing in different parts of the world. Among them, the Neotropical realm has suffered the most dramatic decline of 89% on average (Figure 2). The biggest drivers of biodiversity decline in the LPI remain habitat loss and degradation, and overexploitation (Figure 4). Together, they account for at least two-thirds of all threats to populations in each taxonomic group (birds, mammals, fish, and amphibians and reptiles) Beyond this, invasive species and disease, pollution and climate change are additional sources of pressure.